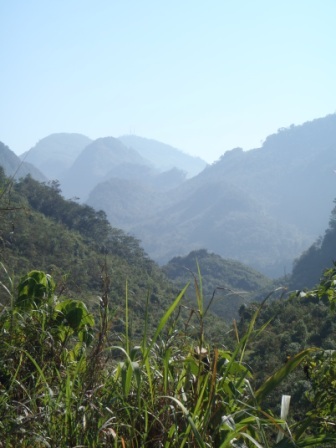 Guatemala: (1st to 5th February) | I should have turned left! 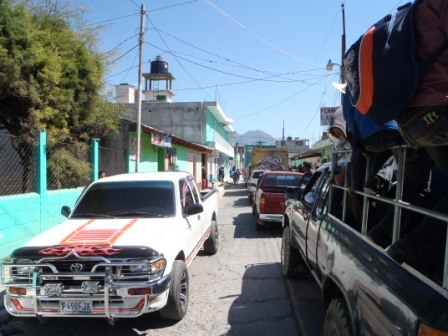 Another enjoyable early morning ride down the Route de Flores to the Guatemala border. I am not an early morning person so usually avoid getting up early like one would avoid the plague. However I enjoy these early morning rides so much I think I might start doing this when I am back home. The El Salvador border was quiet and I was the only person in both the immigration and customs queue, easy peezy and finished in 15 minutes. Entering Guatemala took the usual silly paperwork process. It is not difficult just time consuming and totally inefficient something that drives me crazy. I grin and bear it and being a small border I am done in an hour, photocopies and all. The first thing I notice about Guatemala is that it is far more populated than any Central America country I have visited so far. There is also a lot of litter on the roads, but the roads themselves are okay. Some are in very good conditions others not excellent but not too bad either. Things go well for the first hour until I hit traffic. I guess this comes with an increase in population. It took me 6 hours to do 200kms and most of that was bumper to bumper traffic. There is only so much lane splitting you can do with panniers on your bike. Door to door, traffic jams and border crossing all included it took me 10 hours to get to Lake Atilan from Apaneca. 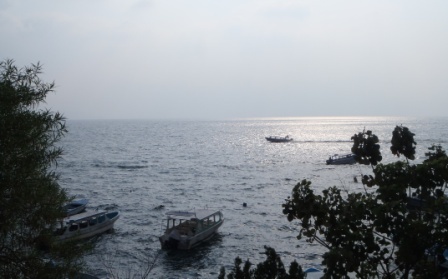 By time I arrived in Panajachel at Lake Atilan, I have to admit I was in a less than savoury mood. However the gorgeous hostel I was staying in, a hot shower and a good meal soon put me right. Panajachel is a typical tourist town full of local arts and crafts, some tourist tat, a lot of tour companies and many restaurants. I have to admit though I enjoyed walking around it and got some good advice about the route to San Agustin Lanquin from an extremely nice and helpful man at one of the tour companies. Despite knowing I was not going to take one of his tours, as I was on my own bike, he still spent a good 30 mins with me talking about the route and biking through Central America. Lake Atilan is also quite beautiful. Sadly it was quite hazy so my photos are not great. 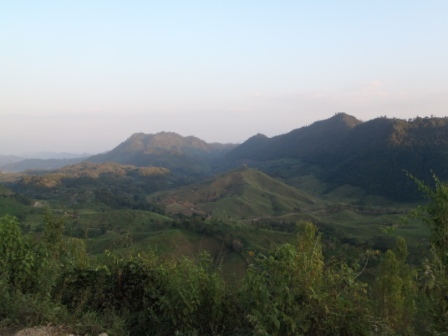 After seeing Lake Atilan I headed out to San Agustin Lanquin, this area is supposed to be one of the most beautiful in Central America and the scenery certainly is spectacular. Since it was only 287kms away I thought I’d be there by lunch and have the afternoon to visit the natural sites. Hmmm this was wishful thinking. My GPS does not work in Central America but with my map and asking directions I have had no issues on any of the roads in any of the countries … until Guatemala. I made a couple of bad assumptions with regards the roads I thought I was on and got badly lost twice. Plus each village you pass has a number of those darn speed bumps and Guatemala is fairy densely populated so you pass village after village. The main roads also go straight through the towns which are not on grid system and have these infernal one way systems, so every town was like a maze to me. 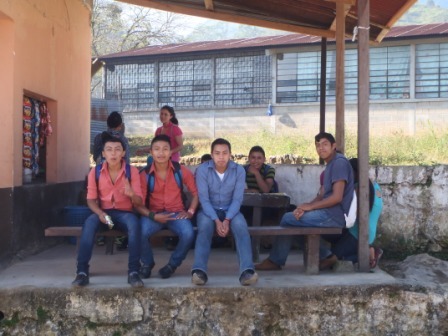 The great thing is that the Guatemalan people are lovely, very friendly and helpful, so asking directions was never a problem even with no Spanish. The amusing thing though is that the answer is always ‘directo’ with fingers pointing as to which road to go ‘directo’ on. It took me a little while to realise that it was only ‘directo’ to the next intersection. Some people gave me great and detailed instructions but in Spanish. I’d usually understand the ‘directo 4 quadrant’ bit and then get lost after that. Once I realised the pattern I simply stopped and asked directions at every intersection and often simply in the middle of a long stretch of road to confirm that I was going the right way. 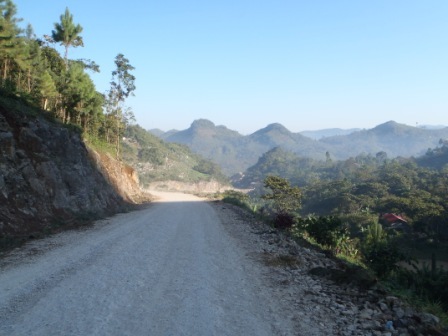 A dirt road somewhere in the centre of Guatemala but who knows where I was. All this took time, especially since I had gotten lost and got myself on a secondary dirt road. I still got to where I was going but only at 5pm, 10 hours on the road and I was exhausted. So no natural sites for me, I showered, ate and had an early night. However not before meeting Claire, another solo female biker. What are the odds? We were literally in a hostel in this tiny little village town and bumped into each other. What a nice and interesting lady. 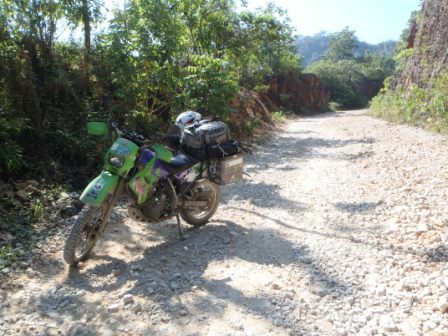 Claire is from the UK but lives in Australia and is riding through South and Central America on a Honda 250. She had been on the road for a year when we met and will soon be going back to Oz to find work (she is an archaeologist) while storing her bike in Mexico so that she can return and keep travelling. 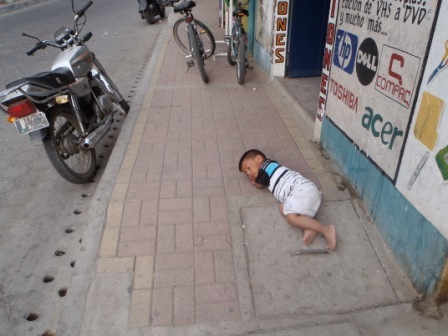 Knowing now that travelling in Guatemala takes longer than anticipated I got up early and left the hostel at 7:30am. 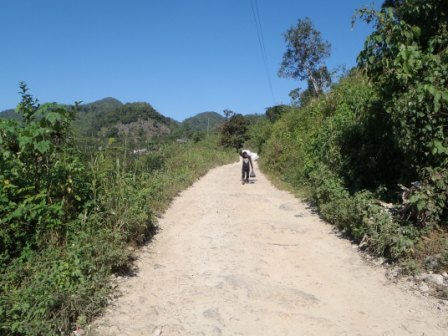 The first 55kms from Lanquin to Chipam is dirt so I was prepared for it, but boy this was no simple dirt road, this was steep up and down rocky tracks. At some point I felt like I was riding on a road made of marbles and bricks. Funny enough I was enjoying it, it had been a long time since my knobblies had been on dirt and gadget is just an awesome litter bike to ride off road. However just as I was settling into enjoying myself and not wanting the dirt to end, things went wrong. Seeing the people and how hard they work truly makes me appreciate my life. This man was carrying a sack of grain for miles and yet still greeted me with a lovely warm smile and Buenos Dias like everyeon in the rural areas do. In Guatemala instead of begging many people fix the potholes on the road and then stand next to them and ask for money. On many occasion I have stopped and given the people a few Quetzal. I do this only if I think they have made a real effort and a difference which I find the old people and women often do. Contrary to the young teenagers and kids who just fill a hole or two with stones and dirt but don’t really do a good job and I won’t stop and give them anything. I will also only do this on tarmac as potholes are just rubbish. On dirt roads I don’t really care about the road as I’m on a dirt bike, and to make matters worse the people who fix them put a rope across the road to stop you and demand money. This is just extortion and I won’t pay anything, also if I stopped and gave everyone money I’d whip through my budget in no time. So the road rope thieves, as I call them, get a few choice words from me and let me pass. Going down a rather steep slippery rocky spot I came across a road rope thief. Seriously what a dumb place to put a rope, I mean never mind engine breaking, this particular stretch had me engine braking and constantly touching both my front and back breaks. So when I saw him I waved to get out the way and shouted ‘no move’ as loud as I could. He didn’t and so I had to slam on brakes and promptly dropped the bike. I swore like a trooper and extremely loudly, he came rushing over apologetically and helped me get the bike upright. I was furious; however hope that in future he will not stop bikers and only cars, which would benefit from his fixing efforts. I was fine the bike was okay ish… I had snapped the front brake almost clean off, it was just not usable and guess which spare part I don’t have (you can’t carry everything) Damn I was doubly incensed, but got back on happy to continue just on my back brake. This was nearly impossible on these steep rocky roads. I tried going really slowly but after dropping the bike a second time I realised that I needed to do something. So out came the toolbox and all I could find was a flattish steel pipe that fitted over the broken stump of the brake. I thought this was a good find and a great fix but sadly it was too long and did not give me the leverage I need to brake fully. I eventually resorted to duct taping the broken piece as far across the stump as possible and as tight as possible. This only gave me about a 2cm piece to use as a brake, but enough to get me down the mountain. 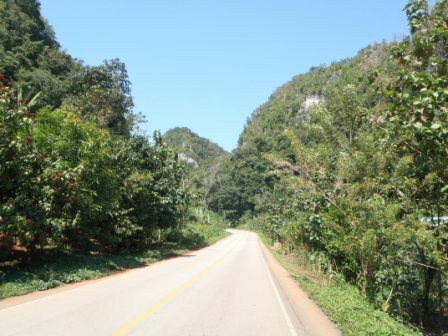 Fortunately once down (about 8kms from the repair site) the road was flat all the way to Tikal. This was good as I could use my back brake and also the duct tape had started to stretch, so my temp fix wasn’t very effective anymore. 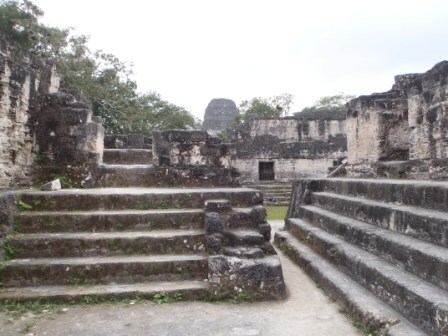 I knew I had to find a permanent fix but decided I’d do so in Belize as Tikal is a tiny town with no bike dealers. All in all it took me 3.5 hours to do the first 55kms of the day and I had almost 300 more to go. The scenery at the start of the day was fantastic just breathtaking but soon got flat and boring. However the road was good so the rest of the day was uneventful, just long. 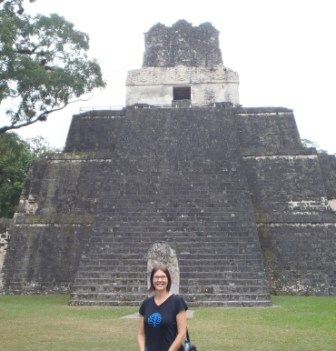 It ended up being another 10 hour day and I arrived at the hotel in Tikal park at 4:30pm. I had now had 3 x 10 hours days in a row even though the distance was only between 275 and 355 kms, but with traffic, border crossings, dirt roads, getting lost and breaking the bike the days took forever. 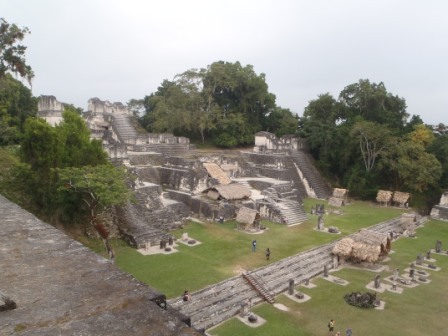 So I arrived in Tikal exhausted and was very glad to have 2 days there plus another 2 days in San Ignacio in Belize. I was looking forward to taking it a little easier. 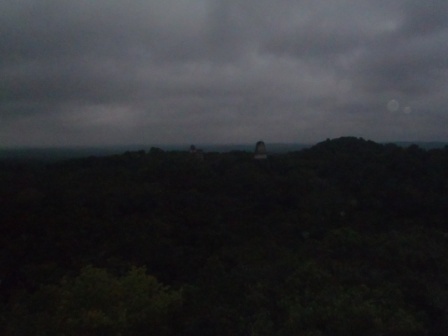 I could not wait to see the Tikal Mayan runes so had decided to take the 4am sunrise tour. Getting up at 3:30am was no easy task but it was well worth it, not so much the sunrise as it was totally overcast so we saw no sunrise at all. 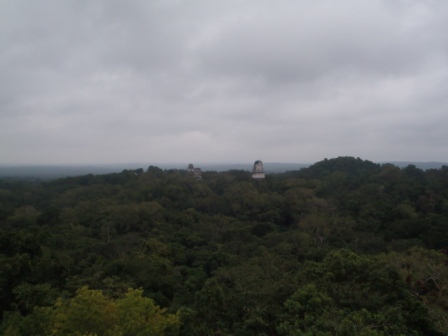 However the guide was fantastic and getting to the site so early and sitting on top of a huge Mayan temple listening to the jungle slowly wake up is totally awesome. 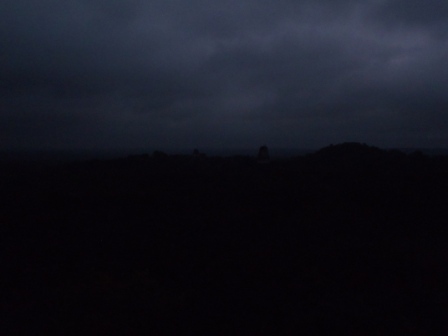 We walked for an hour and climbed the Mayan temple and waited for another hour for the sunrise. During this time we first heard a large bird flex and flap its wings with no sound, then for almost an hour a ground pheasant grunting. This honestly sounds like a dull throaty snore (as opposed to nasal snore, and apparently jaguars sound the same) Then the monkeys start, the howler monkeys make the creepiest sound but it’s fantastic to hear this cacophony kick off one monkey at a time. It is only the alpha male in the group that howls but the alpha males from the other groups will reply one after another building into the amazing symphony of sound. After the monkeys the parrots wake up, or are perhaps woken by the monkeys, no wonder the screech so much. 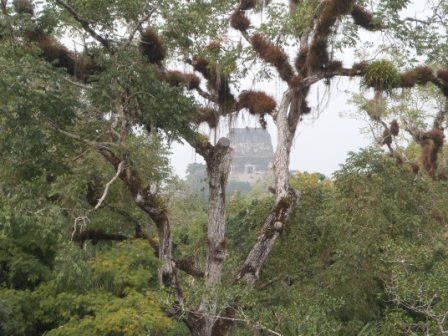 I saw more wildlife in Tikal in one morning than during all my forest / jungle walks over the last 6 months put together. We saw a toad, coatis, a grey fox, howler and squirrel monkeys and so many birds I cannot name them all but includes a large ground crested pheasant, small peregrine falcon and many toucans and parrots and a beautiful red headed woodpecker. The guide had a small bird watching telescope so we go to see the birds up close, it was simply amazing. 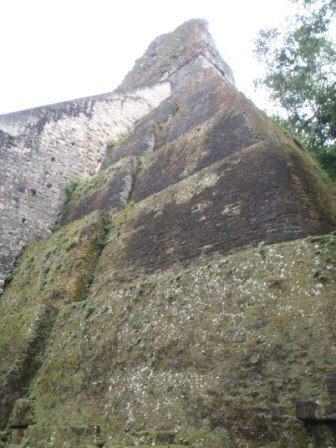 Wildlife aside, Tikal is spectacular, the Mayan runes, of which we only saw a handful, are unbelievably impressive. One of the best things about going so early is that our group of 6 was only one of 3 groups in the park. However even when I went back later in the afternoon to walk around on my own there were relatively few people on the site. 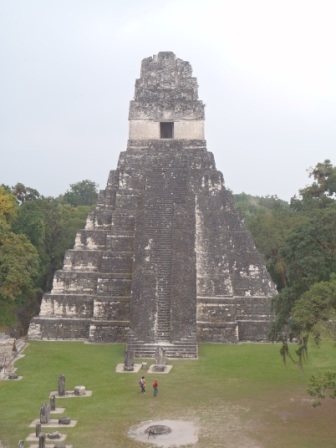 Unlike Machu Pichu and Angkor Wat where it is near impossible to get a picture without people in it, Tikal has relatively few visitors. 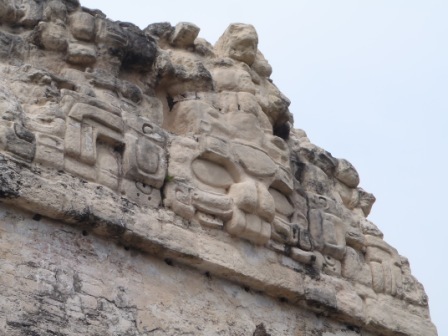 I have wanted to see Mayan ruins for a long long time and was definitely not disappointed. 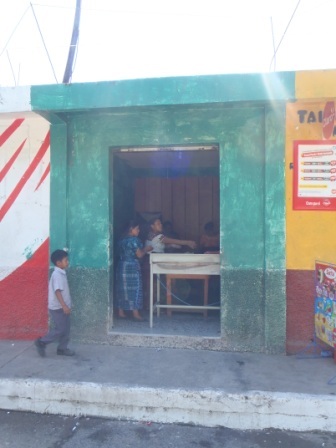 I cannot wait to see more sites in Belize and Mexico. After the early tour and before I went back to see more of Tikal I returned to the hotel and had breakfast with an America couple Judy and Kevin from Seattle. What a lovely couple, they are both fire-fighters and paramedics and we had a really interesting chat about Donald Trump, politics, big corporate companies, their jobs and many other things. They were so interesting and I learnt a lot, I was also glad to hear that they are not Donald Trump fans.